Are Prescribed Statins a Good Idea for Patients with Normal Cholesterol? by Stephen Fitzmeyer, M.D. This is the first of a series of blog posts that will use the TreatmentScores.com application to verify or debunk treatment claims, studies, and gossip. This week's topic received a Treatment Score of -0.1. Half of all heart attacks and strokes happen in apparently healthy people with LDL cholesterol levels below the current recommended level. So, we asked: "If your cholesterol is normal, can taking statins reduce your risk of death from heart disease or stroke?" Cardiologist Dr. Paul Ridker, a professor of medicine at Harvard Medical School, the lead scientist on the landmark JUPITER trial, showed that statins, specifically rosuvastatin, might offer a substantial benefit to people with normal or even low levels of cholesterol. In the JUPITER trial they "randomly assigned 17,802 apparently healthy men and women with low-density lipoprotein (LDL) cholesterol levels of less than 130 mg per deciliter (3.4 mmol per liter) and high-sensitivity C-reactive protein levels of 2.0 mg per liter or higher to rosuvastatin, 20 mg daily, or placebo and followed them for the occurrence of the combined primary end point of myocardial infarction, stroke, arterial revascularization, hospitalization for unstable angina, or death from cardiovascular causes." We focused on Overall Survival to calculate the Treatment Score, because it is the hardest, most objective endpoint. We plugged several studies' statistical results into the Treatment Score Calculator(TM), added negative side effects, and came up with a not-so-great Treatment Score of -0.1. Our original gross Treatment Score for Overall Survival was 0.55, as in an increase in overall survival of 0.55% at 2 years, which equates to a grade of 'E'. However, the risk of complications from negative side effects lowered that score to -0.1. Of greatest concern was the increased risk of developing diabetes or rhabdomyolysis, which suggests that preventative rosuvastatin is not worth the trade-off. Negative side-effects we scored: constipation, diabetes, headache, myalgia, myopathy, nausea, rhabdomyolysis, tendinopathy, and weakness. In the next article I will look into studies that claim lowering homocysteine levels in the blood can prevent heart disease. Dr. Fitzmeyer is a Physician Informaticist with advanced post-doc training in medical informatics from Boston University/Boston Medical Center and the Boston VA Healthcare System. N Engl J Med. 2008 Nov 20;359(21):2195-207. doi: 10.1056/NEJMoa0807646. Epub 2008 Nov 9. Rosuvastatin to prevent vascular events in men and women with elevated C-reactive protein. Ridker PM, Danielson E, Fonseca FA, Genest J, Gotto AM Jr, Kastelein JJ, Koenig W, Libby P, Lorenzatti AJ, MacFadyen JG, Nordestgaard BG, Shepherd J, Willerson JT, Glynn RJ; JUPITER Study Group. THIS BLOG: Follow this blog by submitting your email address into the box near the top right. You must always see a licensed physician for diagnosis and treatment. You cannot use Treatment Scores to diagnose or treat yourself. 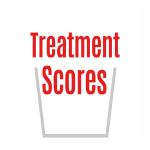 Treatment Scores are only an educational exercise. Death or permanent disability can result if you don't see your own medical physician. Death or permanent disability can result if you don’t call an ambulance or go to the emergency department immediately for emergency or urgent medical issues. We claim no accuracy for Treatment Scores, because the underlying medical studies can be wrong or the methods can be wrong. You must always see your own physician. We make no promises, claims, or warranties whatsoever. Follow by Email. Enter your email and check for your confirmation email. Should You Take a Statin? What is the Net Treatment Benefit? Why You Need Treatment Scores! Treatments to Prevent Death. Do You Want to Live Longer?